To encourage the conversion of Jews to Christianity, the Committee of Guardians for Israelite-Christians was established in Russia under Alexander I. It came into existence by an imperial decree of March 25, 1817, which describes the condition of converted Jews as full of hardship in consequence of the animosity of their former coreligionists. The government ordered all administrative officers to help and protect all such converts, and to form the Association of Israelite-Christians, to which should be given land in one of the northern or southern governments. The members of the association were to be empowered to found settlements on the land granted, to admit strangers into such settlements at discretion, to engage in agriculture, trades, commerce, and manufactures, and were to be exempted from the obligation to join a gild. Moreover, converts, including foreigners, were to be freed from all compulsory government service. The association was also to be permitted to regulate its own local affairs and to elect delegates for that purpose. In 1818 the Committee of Guardians commissioned a certain Misko to select suitable lands for the settlement of the Israelite-Christians. Misko spent much time inspecting various lands in New Russia, and decided on a tract near the cities of Taganrog and Mariampol. A correspondence which lasted six years ensued, but with no result. When M. S. Vorontzov became governor-general of New Russia (1822), the matter was referred to him by Count A. N. Golitzyn. Vorontzov regarded the project favorably, and on making inquiries (1823) found that the settlement had not yet been established, and that necessary information was still being collected. The formalities involved delayed the settlement year after year, until, in 1833, the committee itself ceased to exist. 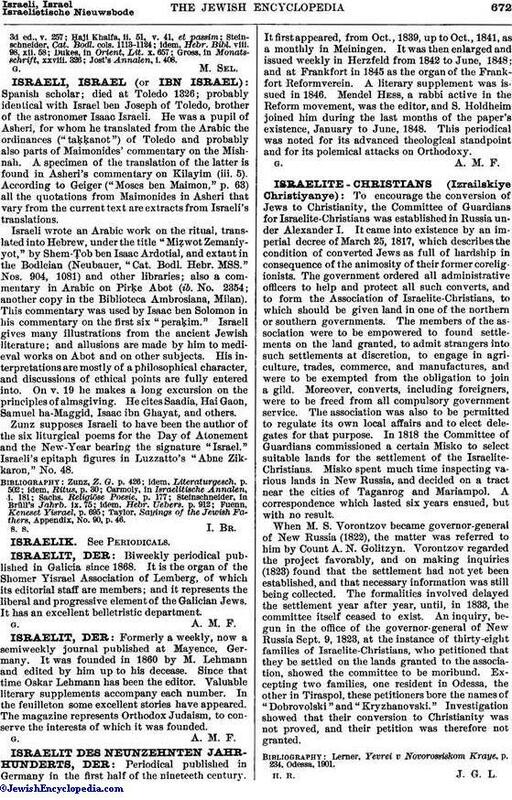 An inquiry, begun in the office of the governor-general of New Russia Sept. 9, 1823, at the instance of thirty-eight families of Israelite-Christians, who petitioned that they be settled on the lands granted to the association, showed the committee to be moribund. Excepting two families, one resident in Odessa, the other in Tiraspol, these petitioners bore the names of "Dobrovolski" and "Kryzhanovski." Investigation showed that their conversion to Christianity was not proved, and their petition was therefore not granted. Lerner, Yevrei v Novorossiskom Kraye, p. 234, Odessa, 1901.